At St. David’s Episcopal Day School we not only promote excellence in education, but we also embody our slogan “Learn, Love, Lead” through the principles and ideals of Episcopal education. We consider our emphasis on character development and spiritual growth a unique and defining characteristic of our day school associated with an Episcopal parish. We are committed to promoting Christian values rooted in our Episcopal school identity in everything we do – in our school community, our daily classroom routines, and our curriculum. Individuality – We embrace each individual in our school community as a child of God and promote self-esteem, confidence, and independence. Children learn in an environment that supports personal growth, unique learning styles, and creative thinking. Diversity – We are committed to teaching children how to live and learn among people of diverse races, cultures, beliefs, physical abilities, learning styles, ages, and economic backgrounds. 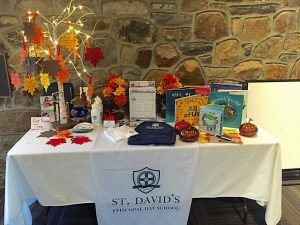 St. David’s Episcopal Day School is accepting of children and families of any religion and faith. Our curricular themes promote fairness, tolerance, equality, and multicultural awareness. Kindness – We believe in the power of kindness, compassion, generosity, cooperation, and empathy to change the world. Through developmentally appropriate service projects, students learn how to help others, how to ‘give back’, and how to understand the complexities of social justice. We practice these ‘kindness’ virtues as well as sharing and being a good friend, on a daily basis within our classrooms, school community, and in activities with our Episcopal parish. Citizenship – We help our children learn about the vitality of community through age-appropriate responsibilities and roles within our classrooms. Respect – We respect the dignity of every human being and show our students how to lead lives respectful of oneself, others, the environment, and God as creator. Perseverance – We strive to help children understand the value of facing life’s challenges. Our long-term project-based learning activities and gardening lessons promote persistence and problem solving within the context of real-world applications. Integrity – We teach children how to live a life of excellence and honesty. Our devoted teachers and staff serve as role models for integrity and lead by example. Children participate in daily “jobs” such as snack or calendar helper to learn the importance of being a vital aspect of a community. Each classroom is equipped with a multicultural/diversity center with materials and books that promote understanding of people from different backgrounds and/or religions. Examples of items in this center include things such as books about children with food allergies, disabilities, and autism; a child-friendly bible; or a Noah’s Ark play set. Throughout the year, we include materials that educate children about various holidays and celebrations such as Christmas, Chinese New Year and Hanukkah. Classrooms are decorated with photographs of children and their families to foster each child’s identity. Our “Star of the Week” activity, in which each child has the opportunity to share his or her special qualities with the entire class, promotes individuality and self-confidence. In a unit on friendship, children gain an understanding of kindness and respect and how to resolve conflicts through problem-solving. Children explore 39-acres of land on the church’s historic property. In this “outdoor classroom” and our gardening area, children learn thankfulness, how to respect nature and all of God’s given gifts. Parents and caregivers are invited to volunteer in our classrooms to share their family’s unique qualities and traditions with our classes. Each month we celebrate a different “value” by selecting a book to be read aloud in each classroom. These monthly books spark important conversations and activities surrounding such topics as friendship, empathy, differences, thankfulness, sharing, and individuality. Our students create birthday cards for members of St. David’s Episcopal Church to show kindness and promote empathy. Families and children participate in school-wide service projects that help communities in need. 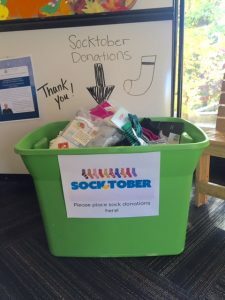 Examples include book, clothing, and food drives for non-profit organizations.